Modelers must be well trained on the basics of BIM Execution Plans (BXP). To educate modelers and developers in these basics, the CD-BIM program has developed the CD-BIM Sample BXP. 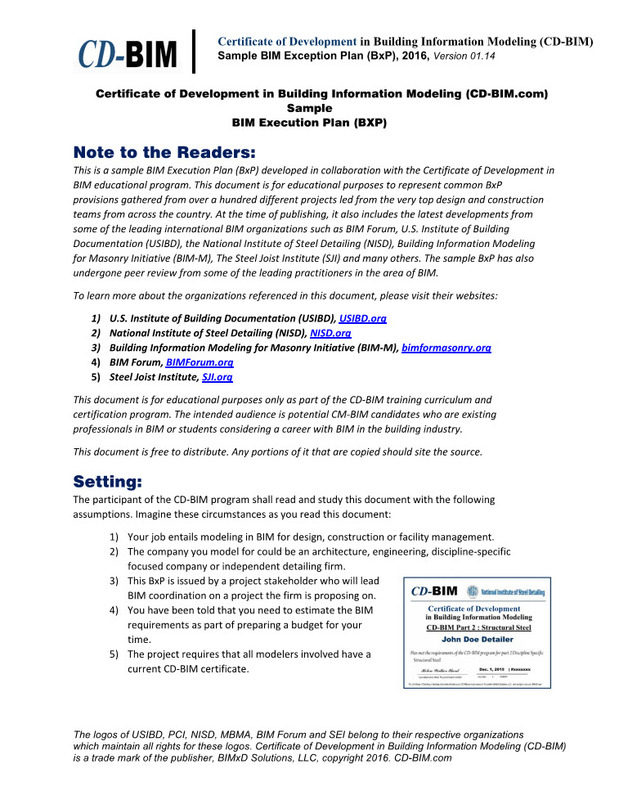 The CD-BIM exam questions will evaluate each modeler’s basic understanding of BIM Requirements. In summary, an effective BXP is essential for a successful BIM process. CD-BIM has created the following CD-BIM Sample BXP with input from industry leaders as an education reference. The Sample BXP will enable students and professionals to better understand the key components of an effective BXP. This sample is free and may be used on projects with proper citation. Please become a member of the CD-BIM site to download the free CD-BIM Sample BXP as well as other useful content.